Public demonstrations are to be held around the 26 Counties tomorrow (Saturday) to demand a fairer deal on the state’s banking crisis, which will now leave taxpayers paying €60 billion for one bank alone. The debt owed by the collapsed Anglo Irish Bank was converted to sovereign bonds on Thursday, making Irish taxpayers fully and irreversibly liable for the gambles of Anglo’s bosses and bondholders. The announcement was made with considerable fanfare by the Dublin government after the President of the European Central Bank, Mario Draghi, finally indicated he would not oppose the move. The total cost to the Irish taxpayer of the bank’s collapse will now reach 60 billion euro, or 40% of the state’s annual GDP. Sinn Féin and other left-wing parties lambasted the government for failing to negotiate at least a partial reduction of Anglo’s debts. But government spin-doctors were hard at work, convincing both major Irish national newspapers to falsely proclaim savings of €20 billion on their front pages. However, no savings will ensue from the transaction -- instead an additional €32 billion cost will be borne by future generations as the Anglo repayments are spread out over four decades. The failure of successive governments to make Anglo’s financiers responsible for their losses will require every man, woman and child in the state will pay €14,000. The money will be paid to international speculators and capital funds now holding the bonds issued by the criminal bank. Government backbenchers reacted with glee to the news that, during their term in office, the costs facing the state would be reduced by over a billion euro per annum. Many expressed confidence that their future election chances had brightened as the pressure on upcoming budgets had lessened. Financial analysts were wary of the additional debt taken on by the 26 County state, about 26% of Ireland’s GDP, and said it had increased prospects of a future (second) bailout from the International Monetary Fund. EU leaders backed the move, which they said would profit European banks still holding and trading Anglo debt. 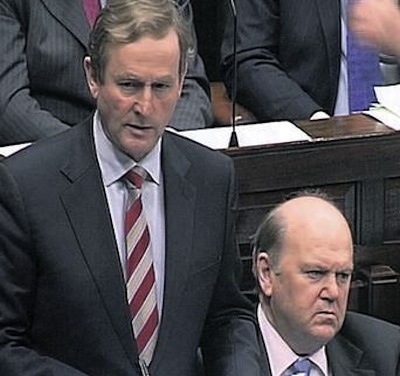 The decision to press ahead with the conversion of the Promissory Notes issued by the previous government followed chaotic scenes at the Dublin parliament on Wednesday night and Thursday morning. TDs and Senators were called in to rush through the necessary legislation in the early hours of Thursday morning, before the start of business on Thursday, in order to ensure the liquidation of Anglo took place without the threat of injunction by creditors. With the memory of the disastrous 2008 bank guarantee still fresh, the left-wing opposition parties were incensed at the plan and the suddenness with which it was presented. But despite serious question marks over the bill’s constitutionality, President Michael D. Higgins agreed to fly in to sign the legislation before immediately resuming his state visit to Rome. Speaking on Friday morning, Minister for Finance Michael Noonan admitted that after the debt restructuring, he could not rule out a second bailout, which would require even more severe austerity measures. But he denied accusations of short-termism, and insisted he had no alternative. “The European Central Bank refused point-blank to give any reduction, not by one euro, on what they call ‘official debt’ - that’s the debt owed to the European Central Bank,” he said. Trade union leaders have called for protests against the move, pointing out that the state has now shouldered 40% of the entire EU banking debt in order to sustain Europe’s finances. Sinn Féin Finance spokesperson Pearse Doherty said that the government had “kicked the debt can further down the road”. He told the Dáil: “This week my youngest son began to crawl... yet when he will be 40 years of age the State will still be paying back the toxic debts of Anglo Irish Bank. He warned that the Troika of lenders who bailed out the previous government - the IMF, ECB and EU - had told his party that any funds arising from the restructuring of the Anglo debt in the short term must be used to pay down the national debt, rather than be invested in jobs or relief from planned austerity. “This week the government had a historic opportunity to secure a real reduction in the cost of the toxic banking debt foisted on the people by Fianna Fáil [of the previous government],” he said. Sinn Féin leader Gerry Adams accused the government of ensuring that a young person will be paying the debt “for their entire working life”. “We are handing a legacy debt to them and we have no idea what the economic and political circumstances will be when the bonds mature,” he said. “That is wrong. It should not be paid for the simple reason we cannot afford to pay it”.